A bay and a cape in the headline – Terra Nova Bay, Cape Hallet – both on the coast of Victoria Land in the western Ross Sea, that indicates a wealth of overwhelming impressions. 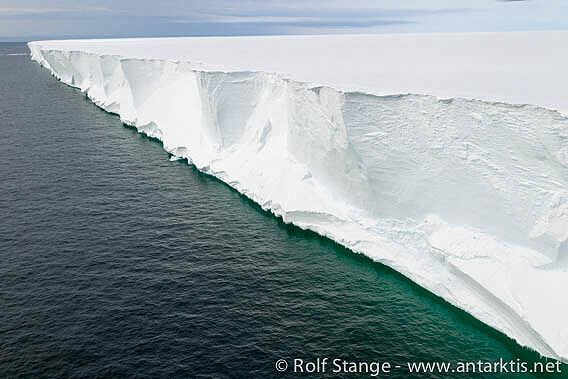 Some of the Ross Sea’s great iceberg alleys, huge glacier tongues, penguins and orcas almost guaranteed, possibly a landing, maybe on Inexpressible Island, where Scott’s northern party was forced to winter under very difficult circumstances. Zodiac cruises, helicopter flights. Under the midnight sun, before breakfast, from early morning to late evening. Well, it turned out to be a very relaxed day. As it turned out, the coast was everywhere blocked by dense belts of ice. Many miles of old, tough floes. So we stayed far off the coast, felt like at high seas, with low clouds and stiff wind. Well, the Ross Sea is no lake. On the other hand, there is nothing wrong about relaxing a bit, after the long days we have just had. And Cape Adare is still ahead of us. Fingers crossed. We made another attempt last night to zodiac-land at Cape Royds, just to find out that Backdoor Bay was still as much filled with brash ice as the day before. So today was to be the day. We gave it an early morning start, dragged the helicopters out and soon the air bus shuttle service was in operation. Cape Royds is at the foot of Mount Erebus, a very volcanic landscape with some peculiar erratic boulders of granite. 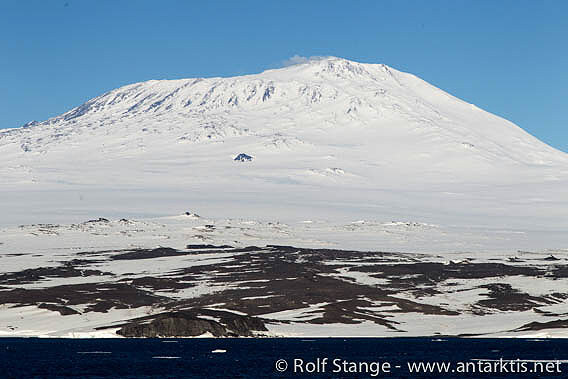 A beautiful, if not slightly dark scenery, which can be very grim at times of bad weather, but just grand on a sunny day like this, and again Mount Erebus is looming clear from any clouds above the site of our excursion. Which is very appropriate, as it is from here it was climbed for the first time ever, during the expedition we want to pay hommage to now. The Nimrod-expedition (1907-09) was the first one Shackleton was in charge of himself and certainly his most successful one ever. He almost reached the South Pole. Within less than a hundred miles from it he saw himself forced to give up and turn around, „better a living donkey than a dead lion.“ As mentioned, Erebus was climbed for the first time during the expedition and the south magnetic pole was reached, something James Clark Ross could only dream of in 1841. The hut is smaller and less complex than Scott’s at Cape Evans. Tins are still standing on the shelves. All men shared one room, only the Boss had a little cubicle to himself, which he willingly gave to other expedition members who needed time for recovery. You can even find Shackleton’s signature on a wooden board. Adelie penguins are breeding a few hundred metres away from the Nimrod hut, they say it is the southernmost one anywhere. Maybe there are some more nesting at Cape Barne, a good stone throw further south, I don’t know. Our little pre-breakfast excursion is indeed short enough so we, the guides, just make it back in time for lunch. It always takes a while in the end, as the very last helicopter can only land on the ship once the other one has been shut down, folded together and stowed away. Helicopter logistics are always quite an operation. But it was worth every minute. Even our penguin specialist colleague, not a polar history lunatic or a Shackleton groupie, agrees. Cape Royds would be worth a visit even without the historical hut. After an early start and a long morning out, it is a quiet afternoon on board as we are sailing northwards, leaving McMurdo Sound behind. The few precious days there are over for this time, as always too short, but spoiled with amazingly good weather. Mile after mile through calm, open water, with great views of Ross Island with all 3 major peaks at the same time: Mount Terror, Mount Bird and Mount Erebus, this famous trio of glacier-covered volcanoes. How often can you see them so beautifully? No, we have not just slept through the 28th. It did not exist. The date line. The weather just can’t get better than it is today. 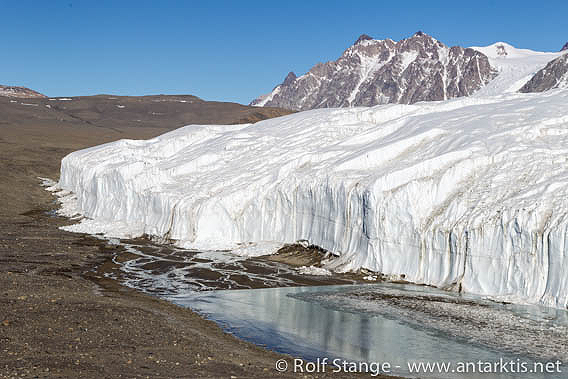 That is the opportunity for our longst helicopter operation, the flight into the Dry Valleys, namely Taylor Valley. The Ortelius is in New Harbour, on the western side of McMurdo Sound, pushing its bow firmly against the edge of mile of fast ice separating us from the real coast. 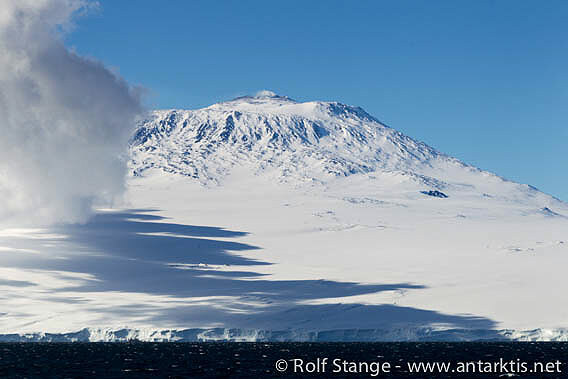 Ahead of us we have got the Transantarctic Mountains, this immense mountain chain with countless wild peaks stretching hundreds and hundreds of miles from Cape Adare to well beyond 80 degrees south. And in the middle of it, these weird valleys which are too dry even for the glaciers. It is a lot of work today for the pilots to fly almost 100 people from Ortelius to Canada Glacier in Taylor Valley. By the way, the last visitors before us, apart from scientists, will also have come from Ortelius, in February 2013. It is, generally speaking, not an overcrowded place. As everything here, visits to the Dry Valleys are strictly regulated. There is only one small visitor zone, everything else is generally off limits. The bottom of the large valley is completely covered with ancient moraines, a huge, colourful open air museum of the regional geology, a wide desert. A little meltwater stream is running from the glacier to Lake Fryxell, which is of course frozen. You won’t find any traces of life here, you would have to have a microscope to discover anything alive, with biggest chances for discoveries in the streams or lakes. Don’t expect trout or salmon, though, but hardy microbes. But even some seals have made it up here ages ago, more than 10 km away from the coast, just to find out that life in the Dry Valleys is no good for a seal. The condition their sad remains are in are silent witnesses to the raging sandstorms that are frequent in this hostile place. Apart from seal mummies and glaciers, the moon must be quite similar, I guess. As a contrast, there is plenty of wildlife at the ice edge, where others are cruising with zodiacs, the day is long and leaves time for more than the flight into Taylor Valley. 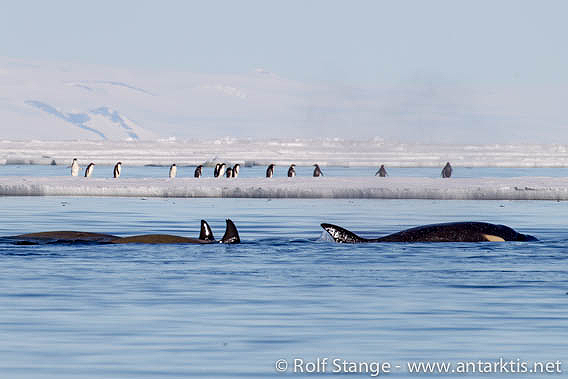 Several pods of Orca are travelling in the channels between the big ice floes, slightly nervously watched by Adelie penguins, who are standing every here and there in small groups. The zodiacs are sometimes in the focus of peaceful attention of these mighty predators. A little walk on one of the ice floes, which measure metres in thickness and are hard as concrete, with Mount Erebus providing a more than appropriate background, rounds the day off. After this great afternoon at Cape Evans, we figured we might as well continue with the momentum we were just in, so on to Cape Royds, just a few miles north of Cape Evans. This is where Shackleton’s Nimrod-expedition was based from 1907 to 1909, not his most famous, but certainly his most successful expedition. And the only one from which he left a hut in Antarctica. So, as usual we went quickly out just before dinner to have a look at the shore if everything is as it should be for the evening landing – and what do we see, Backdoor Bay is completely filled with ice. Not the good, solid fast ice over which you can just walk, but a wide rim of brash ice, too densely packed by the stiff breeze to drive through by boat, but far too small pieces to walk on. Not very helpful. So we do what one should always do and don’t worry about what we can’t do, but rather enjoy the equally recent and pleasant memories from the afternoon at Cape Evans and the views of Mount Erebus in its full splendor, with its famous little steam cloud being ejected from the 3,794 m crater into a clear blue antarctic evening sky. 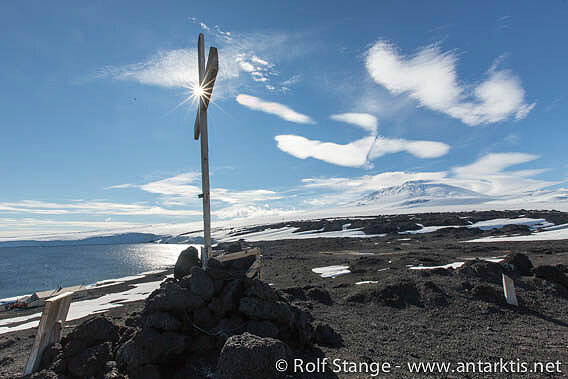 Cape Evans, sacred ground of antarctic history and a stunningly beautiful place in this kind of weather. Base of Scott’s last expedition, with the Terra Nova. The cross is a memorial to Spencer-Smith, Haywood and Mackintosh. Now I am sure you have all done your antarctic homework so you will know during which expedition these 3 men were here and died ..? Yes, it was of course during the Aurora-expedition, the logistical counterpiece of Shackleton’s Endurance-expedition. It isn’t quite true when it is said that Sir Ernest always brought all of his men back home alive. The main focus of attention was, of course, the famous hut of Scott’s last expedition. A time machine that takes you a century back into the heroic days of antarctic exploration. The smell of seal blubber and hay for the ponies is still in the air. 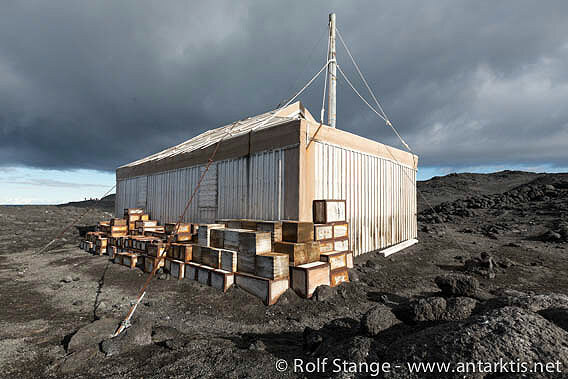 The hut seems to be ready to welcome the explorers back at any time, who are just outside and may be for some time. A sacred place. Mount Erebus is towering behind the hut in all its splendor today, great views over the barren hills of black volcanic rocks at Cape Evans. There is still fast ice to the south, icebergs frozen in between islands: Inaccessible Island and Razorback Islands, all of them important landmarks for Scott and his men. And of course for Shackleton during the Nimrod days (1907-09). The day could have had a very early start with a Zodiac cruise at Cape Crozier, where the Ross Ice Shelf meets Ross Island. But the wind was screaming around the ship, zodiacs were not even a remote option. Nevertheless it was interesting to have seen the famous cape, even from a distance. Next to the scenic and animalistic impressions, it is the „Worst journey in the World“ (splendidly narrated by Apsley Cherry-Garrard) which made Cape Crozier famous. I have to summarize this wild story in a few sentences, but not now. Now I have to watch out. 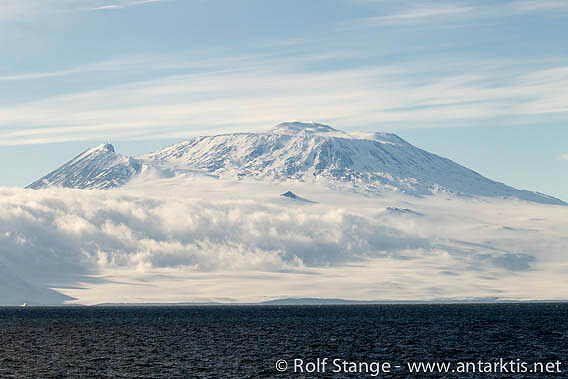 Mount Erebus should come into view soon, and the Transantarctic Mountains are already on the horizon. We are heading for Cape Royds and Cape Evans now. Fingers crossed that it will work out well. Too soon after the opportunity seemed to have come yesterday afternoon to admire the Ross Ice Shelf from the helicopter perspective, the weather window closed again, way before everybody had had the pleasure. Which can stretch the nerves a bit. It is too easy to forget that safety comes first. Few would question that from a distance. But today, the famous ice shelf presented itself in a most pleasant way, in the sunshine and with a few decorative clouds, so we could complete our flightseeing in the best conditions. And it was worth it! 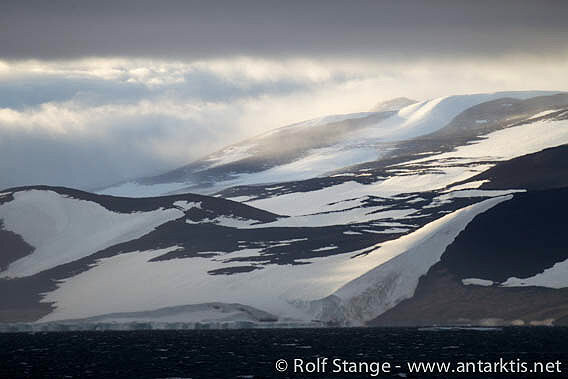 It is good and important to have started our activities in the Ross Sea now. Cabin fever had started to make itself felt here and there. Carsten Borchgrevink was the second one to visit the Ross Ice Shelf after Ross. He landed on a lower part in early 1900, after his wintering at Cape Adare, and noticed that the ice cliff had shifted its position 30 miles to the south. A day’s hike took Borchgrevink to 78°50’S, which was a furthest south that lasted until December 1902. In 1911, Amundsen landed on the Ice Shelf in the Bay of Whales, a wide embayment at 164°W, and put Framheim up, the wintering base. Framheim was at 78°30’S. We have now been at 78°32,5’S/164°54’W, which is 11 miles west of Amundsen’s Framheim, but, what is more interesting, 2.5 miles further south – and we were obviously still at sea, still a mile or so to the ice shelf. Today, Amundsen would have built Framheim several miles closer to the pole. He would certainly have liked that. This is not much of a retreat considering more than a century has gone since then. It is said that the part of the ice shelf where Framheim was standing broke off and drifted out into the ocean in 1928. Snow showers were threatening to take the visibility, so a helicopter landing on the shelf ice as Don had planned was cancelled, so we are now sailing with a westerly course, towards Ross Island (Mount Erebus) and McMurdo Sound, eagerly awaiting what the next days may bring. The Antarctic is living up to its reputation of being a continent of ice this year. Well, it does not exactly come as a big surprise that the seas around Antarctica have ice. But it is indeed a heavy ice year, and it would be nice if the ice charts were a little bit more precise and reliable. We are now in the northeastern Ross Sea, 250 nautical miles northeast of the Bay of Whales, and according to the satellite-derived ice chart we should have mostly open water here. But one drift ice field is followed by the next one, and even though the average ice cover is no more than 2/10 to 4/10, we do have dense fields with larger, stronger floes quite regularly and need to maneouvre around them or carefully break through them. Not only is this a lot of hard work for the Captain (I don’t think he has left the bridge at all last night) and his guys, but it also slows us down considerably. Yesterday evening, a snow shower decreased the visibility to almost zero, and when the curtain went up again, the ice was pretty dense in most directions. A first helicopter ice recce flight covered 60 miles (nautical) in our general southwesterly direction, achieving information about a navigable route, but not discovering generally open water. We are eagerly awaiting the further development. But the way is the goal (does that translate ..?). The wonderful world of the ice, including smaller tabular bergs every here and there, was lying around the ship last night, in the soft light of the antarctic midnight sun. Emperor penguins on the ice every now and then. The amazing beauty of the coldest end of the world. I might just write one sentence this time: we have seen a Ross seal. But some more sentences may be necessary to explain why this comes pretty close to a real jackpot. If you travel to Spitsbergen, you will most likely want to see a polar bear. That is easy. Only those who really have done their homework might say: I’d rather see an Ivory gull or a Grey phalarope. That is a bit less easy. This here is similar. If you take a trip to Antarctica, most likely you want to see penguins. And of course I don’t want to put down a lovely encounter with a curious Gentoo penguin, an experience that has made countless visitors to the Antarctic Peninsula smile for more than just a short moment. Or the Albatross, about which Robert Cushman Murphy said „I now belong to the higher cult of mortals, for I have seen the albatross“. That may be taking it just a little bit too far, but an exposure to such an amazing creature may actually make you feel that way. The rarest animal in Antarctica is the Ross seal. After dozens of trips down here through 14 years, including the Ross Sea trip 2 years ago, I have now seen my first Ross seal today. And this includes of course everybody on board, also most of my colleagues, who all have countless antarctic seasons behind them. I believe that Don, our fearless expedition leader, came to Antarctica for the first time with Mawson. It is a while ago. And even he doubled his number of Ross seal experiences with that sighting. A very rough estimate of the „global“ population is something near 130,000. That is not much. That is, actually, very little, considering the immense areas this population of a middle-sized city is spread over. Theoretically, you can find them everywhere around Antarctica, even on the coast of the Antarctic Peninsula. But I don’t know anyone who has ever actually seen one there. 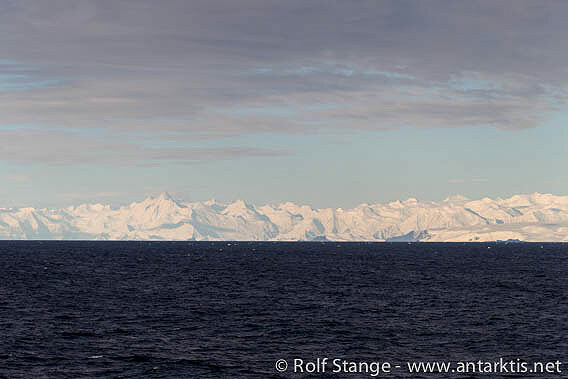 The Ross sea, that sounds like the Ross seal, you will either see it here or not at all. To find this treasured species, you will have to take this long, long trip down here. And when our Ross seal then finally slid past the ship on his ice floe, probably happy to be on his own again, everybody had a wide smile and more than one mentioned to me that this trip is now already a success. Well, of course we are looking forward to more, whatever the next days will bring, but this is definitely a very significant entry in the log. 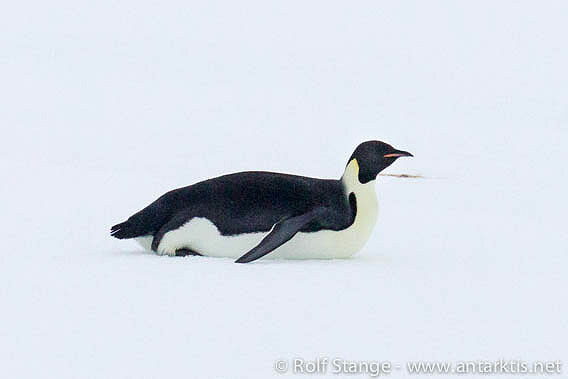 By the way, the sighting of both the first Emperor penguin and the Ross seal have to be credited to Nick, a sharp-eyed fellow passenger from the Netherlands. Well done! (I feel I should add that we guides were busy with the dry-run of the helicopter operations). 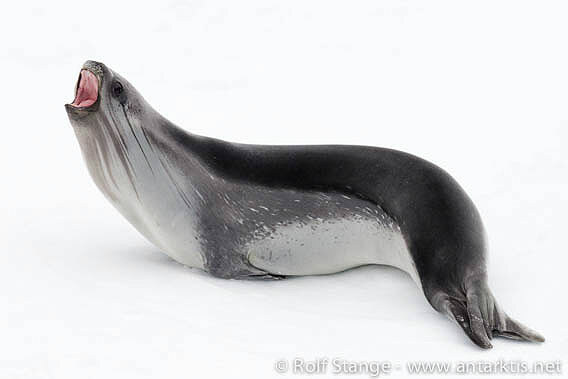 The Ross seal is the smallest of all antarctic seals, and quite peculiar with regards to its body shape with the unproportionally strong neck and the stripes in on the same part of its body. It is easy to distinguish, as soon as you have got a reasonable view of it. And nobody needed binoculars anymore when the ship was near her (his?) little ice floe. Of course you are not coming without hopes and wishes on a big trip like this. And of course it will be safe to say that a number of these wishes are shared by all of us here. Anyone here who does not want to see an Emperor penguin? Unlikely. 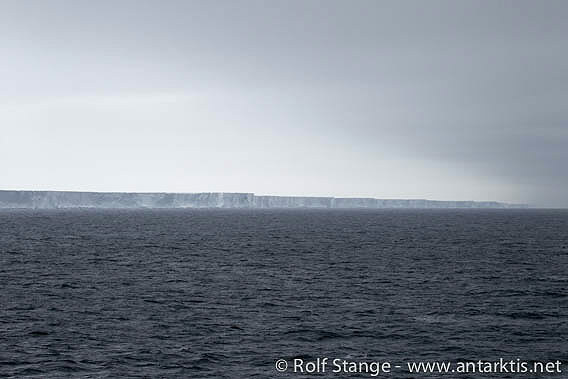 Clearly, both chances and excitements were rising as soon as we had the first bits of drift ice in view. Binoculars are currently in frequent use here. Yesterday evening then the big moment – the first of several! – some in the bar, others in the cinema, but some tireless observers on the bridge. Only moments later, all of us out on the open deck, in the cold wind, to admire the Emperor in his very realm. A lonely, juvenile Emperor, the yellow on the sides of his neck not yet really yellow, rather whitish-greyish, standing there on his little ice floe. Always great to see how such a precious moment lifts the spirits immediately. After a lot of consideration, the (preliminary) decision has been made to set a southwesterly course, directly into the Ross Sea. The ice seems to have opened up along that route in the last couple of days, so it is worth a try. Nobody can know what will actually happen, it is really quite exciting now, truly expedition style. The Ross Sea is a challenge this year. It will be very interesting to hear what the Spirit of Enderby will encounter, they are now sailing south in the western Ross Sea, along the traditional route near the 180th degree of longitude. Ideally, that could become our exit route. Into the ice is one thing. Out again another. We would quite like to get out of it again, not just eventually, but at a given time. We are not the Fram (no, I am not thinking of Hurtigruten now). A shame, actually … but we have all booked our flights back home from New Zealand. Maybe we are getting in the area of the Bay of Whales in some days. This is where Amundsen went alongside the shelf ice edge more than 100 years ago, built his hut Framheim and went straight to the south pole after the winter, a few weeks before Scott went there as well. Framheim was on the schelf ice and does of course not exist anymore, but how great would it be to get there anyway? Maybe. We shall see, we shall see … (as Amundsen said). Many small, open drift ice fields today, smaller tabular icebergs every here and there, with a lot of open water. Very good, we are making good progress now. And dozens of Snow petrels – animals that are well symbolizing Antarctica, as the Emperor penguin. 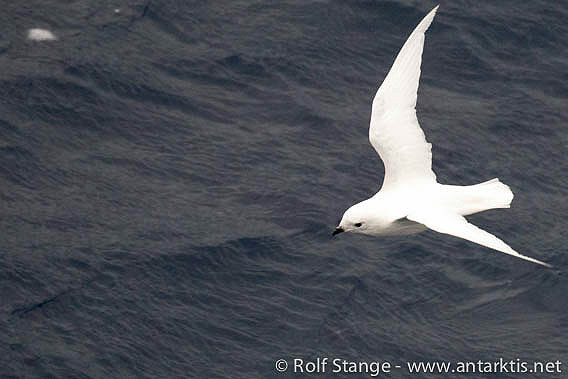 Less famous, but some birdwatchers would give a lot to see just one Snow petrel. And we have had dozens around the ship today, several times. We have been keeping an eye on the ice chart for days with quite some excitiment. 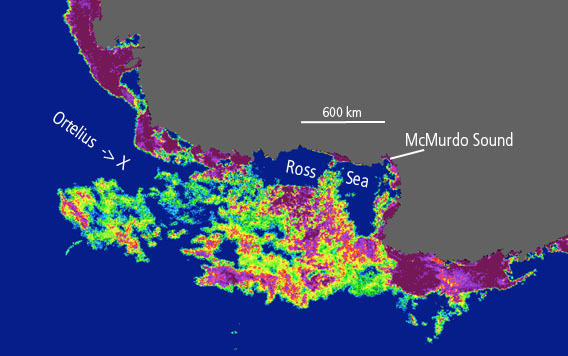 What appears like some colourful square centimetres on paper is hundreds of miles of drift ice in real life, covering much of the Ross Sea. Yellow is not vitamin-rich lemon, but half open water. Purple is not blueberry, but a very dense pack ice cover, tougher than a cherry stone and absolutely inedible. In the arctic, the sea ice is shrinking rapidly. In the Antarctic, it is breaking records. 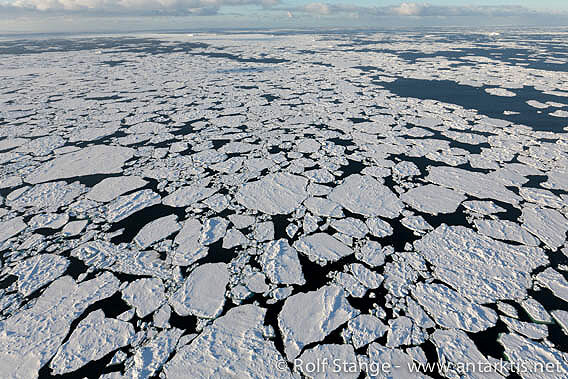 There is a lot of ice in the Ross Sea this year. The ice is the focus of everybodies attention here on Ortelius. We are all regularly examining the icechart, following the development, discussing what all the colours may mean for us. The degree of experience that goes into these discussions is variable, and so is the patience that Shackleton identified as a polar traveller’s most important quality. These ice charts are always rough and sometimes amazingly misleading, and even the satellites don’t know what will happen over the next days. Talking about Shackleton. It was on 20th January 1914 that the Endurance got stuck in the ice of the Weddell Sea. That is 100 years ago today. So we are eagerly awaiting the development over the next days. The first ice floes are drifting around the ship. A beautiful view in the sunshine. 18th-20th January 2015 – As Shackleton said, the most important character feature for every polar explorer is patience. Now we are not talking about spending a long antarctic winter together in a little hut, squeezed around a far too small table with permanent darkness and long blizzards outside. But some days at sea are enough to make the inner clock turn a bit slower. Some may have difficulties with it, but I think, most of us are actually enjoying it. At home we are always on to something, always online, 24/7 workloads, permanent stress. How often do you have the luxury to watch waves for hours on end, waiting for the occasional Cape or Giant storm petrel – they have become a bit rare these days – passing by? One of these days, even a mighty Wandering albatross was seen during the early morning hours. Far south of the convergence, but there is no way too long for these eternal riders of the southern winds. Still, every day is different. One day, the wind was strong enough to be disagreeable for some, one day was grey, the outside world hidden behind a curtain of snow. 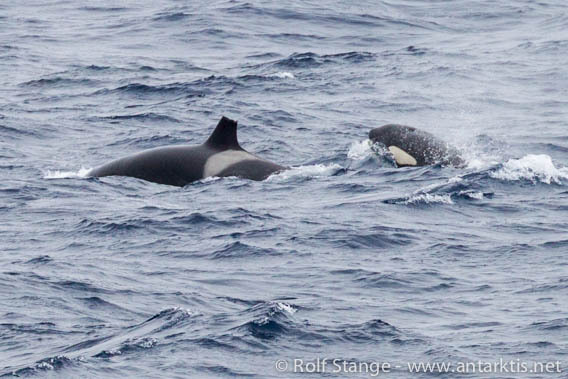 One day, it was after leaving Peter I Island, we had pods of Orcas several times, and today early morning, there were Minke whale backs breaking through the waves, catching some rays of the rising sun.